Fluorescence in Diamonds…Is it a Good or a Bad Thing? When I am asked whether fluorescence is a good or bad feature in a diamond, my short answer is: it can be good, it can be bad. Mostly, it is a positive, but as with all things diamond, the issue is complex. The thing is, as you may already know, no two diamonds are the same. So there is no one measure that will tell you what is a good diamond and what is not. It has got to be a balance of all things. Fluorescence in a diamond is simply just something to consider on its merits. For this, you really should keep an open mind. Unfortunately, misconceptions about fluorescence have become common at the retail level. This is a shame, as you may well benefit from purchasing a diamond that has fluorescence, both in terms of value for money and also in the way the diamond looks to the eye. So What is Fluorescence Anyway? A good question. Fluorescence is the lack of a particular molecule in the diamond’s structure. This happens during the formation of the diamond. At a visual level, it is seen in around 20% of diamonds. It also varies in strength. The lack of this molecule causes a very amazing reaction in some lighting situations, which is in fact really quite beautiful. A sudden flaring of neon blue/purple light makes the diamond glow like a firefly on steroids. Other colour reactions also exist, like yellow and white for example. However, these are less commonly seen. I must say at this point that I am neither a physicist or gemologist. Or a super smart person with degrees hanging on the walls, having spent my entire working life actually being a jeweller. It will get too deep to start explaining the intricacies of a diamond’s molecular structure here. So I want to focus on the visual reasons for fluorescence being a potential advantage, as this is what most people care about in diamonds. I’ll leave the science to others more qualified than I. What I will tell you about, as a jeweller of some 35 years experience is the potential cost benefit, and the positive effect that fluorescence can have on a diamond’s look. There are great reasons for not just automatically ruling these diamonds out. How fluorescence works in a diamond varies. It depends more on the specific diamond rather than saying all fluorescent diamonds look the same, as this is simply not the case. Interestingly enough, it is not really the degree to which the fluorescence is present in the diamond that determines what looks good. A diamond that has “strong blue” fluorescence may be a fantastic looking diamond. Whereas a diamond that only is”faint” or “medium”, may not look so nice. The thing to remember is that non-fluorescent diamonds can look murky too. The two images below show pretty well how this works in a ring. Some of the smaller diamonds in the halo have fluorescence in varying degrees, the others none. Because we selected these diamonds carefully, you can’t tell which is which without a UV light close by. Note, all diamonds will show some colour in this test because a UV light is coloured, diamonds will do what they do best, reflect colour. A Diamond ring with blue fluorescent diamonds, under UV and non-UV light. Most Diamonds With Fluorescence Look The Same, If Not Better Than Those Without. The existence of fluorescence in diamonds in many cases is simply not a visual issue when looked at in normal light. The diamond looks just as it should when it is compared to non-fluorescent stones. In actual fact, the diamond has the potential to look better than non-fluorescent diamonds of the same grade. In a diamond where the presence of fluorescence is a positive virtue, we only realise that the diamond is different when it is exposed to UV light. Then it will show the beautiful bright glow of fluorescent colour. When the UV light is taken away, the diamond returns instantly to its usual non-fluorescing look. Generally, diamonds with fluorescence will be a lower price than those without. This lower cost can vary from just a little to quite a lot, depending on the actual effect, negative or positive on the diamond in question. 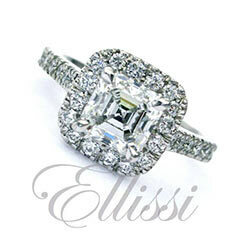 Market resistance is the reason for this lower cost, not necessarily because there is an issue with the diamond. Cutters simply must bend to the market, regardless of whether this is justified or not. This is in fact ridiculous because these can be “Killer Rocks”of the diamond world. This is where a potential advantage lies. With medium to strong blue fluorescence, you can sometimes see the general return of light from the diamond as having a slightly more blue spectrum. Keep in mind we are talking about great subtleties here. Think of how an ice cube just looks white. But then think of all those photos of ice in the Antarctic, where the ice looks more blue/white. This is the effect of light and reflection on the ice. Although for different reasons, this is a good way to think about the way blue fluorescence works in the best diamonds. Lower Colour Diamonds Look Whiter. Lower colour diamonds (we are talking the G-J area here) are brighter and whiter because of fluorescence. The more “blue ice” spectrum that fluorescence can give to a diamond, the whiter the diamond will look when it is face up, if tinted. So it’s a positive here too if you are looking to save on costs by purchasing a diamond in these lower colour grades. When we expose a fluorescent diamond to UV light the effect is in fact pretty cool, well no… actually amazing… So again, I think it is a massive positive in the “right” diamond. Finding a Great Diamond With Fluorescence: What Does the Certification Tell You? What will surprise many consumers, is that the GIA tells us that many, many diamonds actually have some fluorescence from below faint to “very strong”. Often it is simply at a level so low that our eye can’t actually see it. When it is noted by the grader under a UV light, it is marked on the certification. A diamond’s certification will tell you just in a basic way, whether or not a diamond has visible fluorescence, describing it in such terms as “strong” or “medium blue”. However, the certification does not tell you whether or not it is a good or bad thing in this particular diamond. We need to look beyond what the cert tells us and investigate for ourselves what impact, if any, it has on the diamond. Consumers and jewellers alike often misunderstand the impact of fluorescence on a diamond. In recent years a trend has grown to simply reject outright any diamond that displays fluorescence. Why Portray Fluoresence as a Negative? If a diamond has a low lustre and it fluoresces, it is often the case that the fluorescence will get the blame for the poor look of the diamond… but this may not be the cause of this milky look at all. It may well be that it is just the effect of the low lustre. This can be a problem in any diamond, not just those diamonds with fluorescence. This, in part, is the reason that fluorescence is often avoided in diamond selection by those who are poorly informed and do not understand the issue. In my view this the completely wrong approach to diamond selection. Blaming fluorescence for low lustre really can be a case of misdiagnosis. Some of the best diamonds in the world have fluorescence and some of the most terrible do not. Yes, the effect of fluorescence in the diamond can in some cases make the diamond have an oily or milky look. But this is not the case for the great majority of diamonds that fluoresce. Even the GIA has started including info in its documentation to clarify the great negative overreaction in the market to this phenomenon. It is strange that many people you talk to will try to paint fluorescence as a negative. You need to question their motives further. The fact is, many people who sell diamonds in retail shops or on websites are doing so with very little training or knowledge. Often they cannot explain even the simple issues, let alone exactly what fluorescence means. I think it is often the case that this lack of training and understanding leads staff to reject outright diamonds that have fluorescence. This is a shame, as by adopting this blanket approach, they rule out diamonds that may well be fantastic. A lack of understanding and training on the issue and of course worry about having a diamond in stock that has any potential resistance to a sale, all play a part. However, Don’t Just Take Things for Granted, Particularly in Larger Diamonds. Fluorescence often is a good thing. 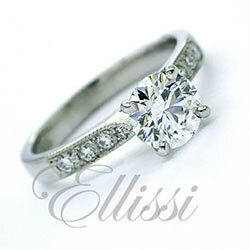 However, it is true that in some cases its presence can be a negative in the look of a diamond. It really just another quality we look at to assess if it is an issue or not. If it is detrimental to the look of the diamond, as with other quality issues, then we rule that particular diamond out during the selection process. Just as we would a diamond that has a low lustre or poor clarity grade. You may not be able to put your finger on just what the issues are in shop lights, however, it could be noticeable later. It would be nice to know that the diamond you buy is a good one. Getting it from a company who knows what it is talking about and knows how to select diamonds correctly would be a good start. Would You Consider Fluorescence in a Diamond? Correctly assessing each diamond is the important thing and this is where many jewellers fail. Knowing what fluorescence is, how it works, and why it is a good thing in many diamonds is important. Jewellers need to have the skills and ability to weed out bad diamond options. A great deal of knowledge is required to produce outstanding results for the customer. It is never easy to explain exactly how a diamond does what it does or why. All diamonds are unique and have properties that can often defy description. The fact is, fluorescence is mostly a problem for those who want to see it as such. You simply cannot quantify the effect of it exactly in every diamond. Every diamond differs, so there is just not one rule to follow. Outstanding diamonds with fluorescence exist, just as outstanding diamonds that do not have it also exist. Some diamonds are terrible and some are fantastic, all characteristics play a part. Fluorescence is not a big scary monster in the cupboard, just something some diamonds have. As with all diamonds, we need to do due diligence on a case by case basis. You should seek a high level of sound professional advice as it is critical to buying a fantastic looking stone.